I'll start off by saying I'm not the biggest board game player out there, but if it's a board game that includes miniatures, nice ones at that... I'm definitely more than willing to give it a whirl. 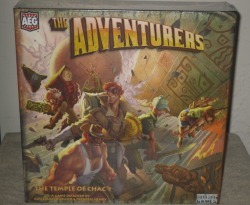 The Adventurers is from AEG (Alderac Entertainment Group) and Dust Games. That's the same publisher/developer combo responsible for the up and coming, and highly anticipated Dust Tactics too. The Adventurers in a nutshell is a game that allows you to play out what it's like to be Indiana Jones or Lara Croft, and to pilfer your way through an artifact littered temple. It's not all shinnys and profit tho, the game also depicts all of the crazy and unexpected things that can happen in those crypt-like settings. 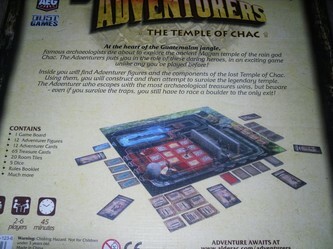 The setting for The Adventurers is the Temple of Chac, which is a Mayan temple with traps galore. Upon entering the temple, you'll face two large walls which begin to close in on you. In the next room there are stone tiles floating over lava, which can individually drop off into the lava, taking you with them. Later players encounter a wobbly bridge sitting over a chasm, which planks can fall off of, and there's even a raging rapids to brave, and in the process you must avoid being tossed over a waterfall like a rag-doll from the current. There's boat loads of treasure to be had too from start to finish. All the while, a gigantic boulder keeps moving closer to running adventurers over, and to beating you all to the exit, trapping everyone in the temple for all of eternity if it makes it out first. At first glance, I'd have to say that it was a little overwhelming to see all of the cardboard pieces, and to figure out where everything went, and what all of the pieces were for, but thankfully there's a really nice full color rulebook detailing it all step by step. The rulebook is 16 pages in all, and the back cover even includes a quick reference guide detailing in a nutshell all of the really important info. 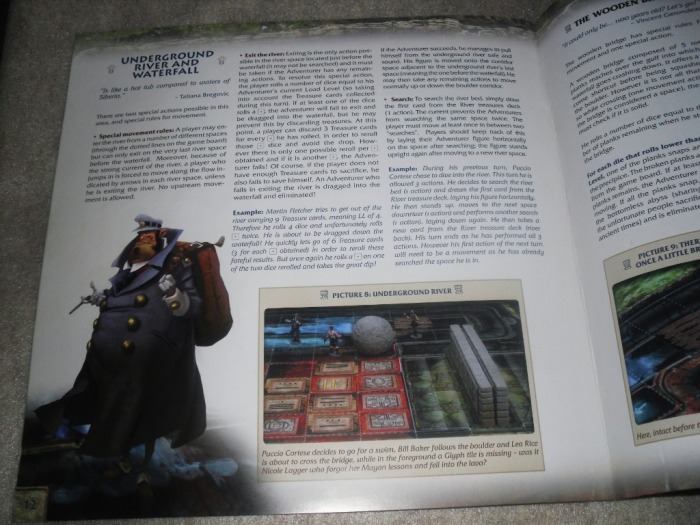 It's a rather large rulebook too, this I liked, because it's almost the size of the box, making it very easy to read. There's even an inventory page at the start, detailing what each and every piece is. 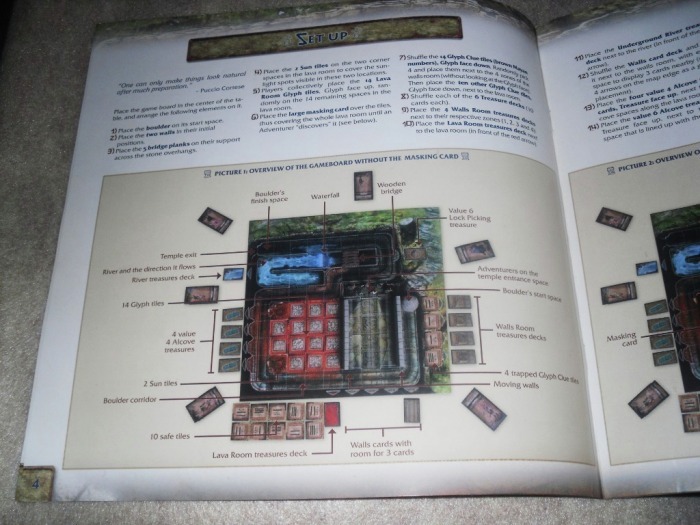 I wish more game developers would take the time to make rulebooks this well thought out. The game itself is really brilliant looking. Even the box is high quality, with a textured feel to it, and it looks like it will last through loads of boxing and un-boxing of the game. The gameboard folds up, and is essentially 4 panels, and it takes up the space of about 22-inches by 22-inches square. 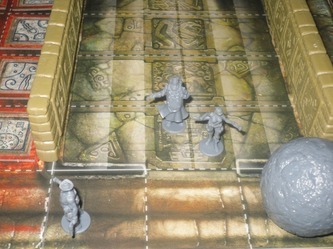 The board is also textured like the box, and so are all of the cardboard pieces throughout the game. Everything feels really durable, nothing at all like the boardgames of days gone by like that copy of Life or Monopoly that may be on a shelf in your closet somewhere. 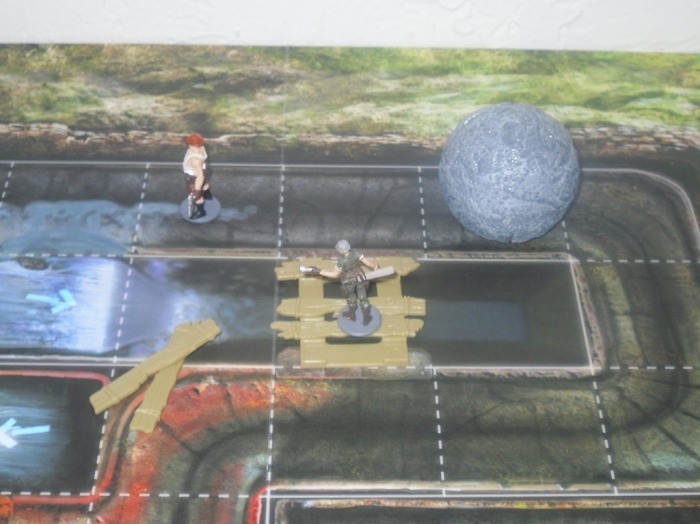 The most memorable pieces are the dozen plastic miniatures, the two plastic walls, the plastic bridge and 5 planks, and the plastic boulder. The miniatures are very detailed, I'd say they're about 20-25mm in scale, as they're really thin, but about as tall as most 25mm-28mm miniatures. The entire artistic style of the game is really whimsical and lighthearted. It reminds me of an over the top pulp heroes comic book featuring 12 very unique treasure hunting individuals. There's a big breasted bimbo (Lara Croft type), the wife-beater t-shirt wearing rugged tough guy in a fedora, a few brainy types, Italian Sailor, French and Chinese explorers, a shifty-eyed criminal, even a noble of Mayan decent just to name a few. Every character has one unique ability too. Arely Tamay the Mayan noble has the Linguistics ability, which gives her an edge in the Lava room. Lea Rice the long legged bimbo character, has the Sprint ability, giving her the means to move one more space, without it costing an action. So who you decide to play as, gives you a small distinct tactical advantage, because the downside is that this is a one shot ability to be called upon only once per game. The game uses an action based system. It takes 1 action to move 1 space, 1 action to pick up treasure cards, 1 action to decide to Decipher a Glyph (which helps you later in the Lava Room), 1 action to try and pick locks, etc. The game utilizes D6, and you roll five dice at the start of your turn every round to determine how many actions you are allowed, based on your treasure load level. See the name of the game is the one with the most toys wins, but only if they make it out alive. Therefore picking up the most treasure, and making it out alive as fast as you can is the #1 objective. It's easier said than done though. On the player cards on the back side are load levels at the top, and actions 5-1 at the bottom of the card. You use the backside of the card of the character you don't have in the temple always to show the current load level and actions, by sliding your player card up or down in front of it, covering info that's not needed at the moment. It was a little odd at first to get used to, but once you've done it in play, it's quite simple. Having 0/3 treasure cards is a load level of 2. Therefore you roll five D6, and ALL of the results equal, or over a two result, is the number of actions you get that turn. Three turns later if you are carrying say 7 treasure cards now, you adjust the player card against the information card to the line showing 7/9 treasure cards, which means that's the load level you are at if you have 7, 8, or 9 treasure cards. The 7/9 cards burden is a load level of 4. So now you roll the five D6, and any results equal to, or higher than 4 is the number of actions you have on your turn. I rolled a 2, 4, 4, 3 and a 6. Therefore at load level 4, I'm allowed 3 actions based on my dice roll since the 4, 4 and 6 are equal, or more than 4.As you can see the more stuff you have to carry, the harder it is to make it through the temple. 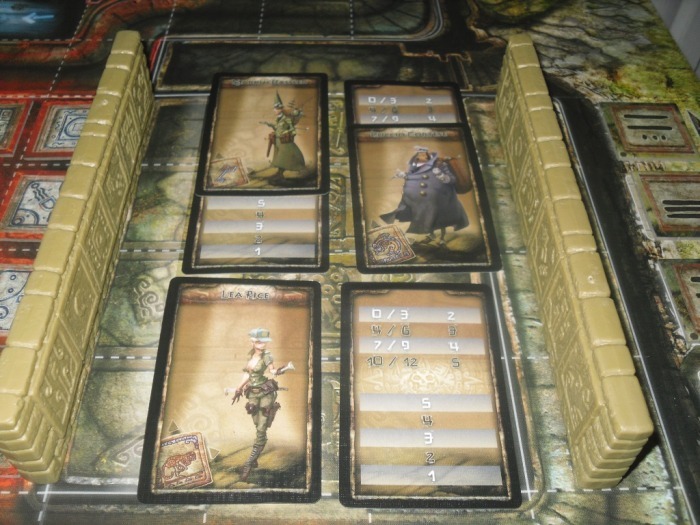 You can also opt to dump some treasure cards at the start of each turn, lessening the load a little. As you make your way through the temple, the traps are going off, and the boulder is moving the entire time along the boulder path. During the Walls room, the walls can close in. 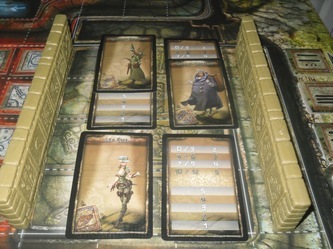 After a turn, three of the Wall Cards are drawn, and flipped over. These cards may be blank, and many are, but some have single arrows pointing to the left or right, and a few might have two arrows pointing twice towards the center, which means, move the walls in one space from each side. There's only three spaces for the walls to move, before you're squished. Therefore the game can be over quite fast for one of your characters with one bad draw if you're left standing in between the walls before the cards are drawn. However, the walls are right at the entrance, and it's rare you don't have enough actions to get out of there to safety. Yet it's a choice, because staying and Deciphering the Glyphs with actions can help you in the Lava Room next. The question is...do you try to set yourself up for the next trap, or do you fly through there without taking any chances of the walls closing in on you? Those are the kind of choices you have to make all the way through the game. After the first turn the Boulder begins to roll. At the end of the first turn you roll a single D6, and if the result is a 3 or better, it moves a space. At the end of the 2nd turn you are to roll two D6 now. By turn 5 it's moving at full steam with 5 dice being rolled, and every result of 3+ equals one square of actual movement for the boulder. This definitely quickens the pace for everyone. The lock picking mechanic is a little unique too. Depending which level of treasure you're going for, it can be as simple as needing a 1, 2, 3 result out of 5 dice, or as complex as requiring 1,2,3,4,5 results on a single roll to get the highest value treasure of them all from the temple. You can however spend an action to re-roll the dice, but stand there too long, and either the boulder may get you, or the other Adventuers just might slip past you and take the lead.. There's definitely that whole “time is running out” feeling to the game as you make your way through the board. Quite frankly, there will be times you don't make it out at all, and the boulder beats you. Other times you'll make out by pure luck. It's hard to tell how it will end. Although some times by the time you've made it through the first few turns, you can begin to predict how it might turn out, but even then it's up to the dice and pure luck at that point. So anything can happen. 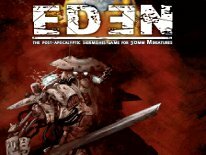 The game is designed for 2-6 players, and each player selects 2 characters/miniatures to play, only they use one at a time. The 2nd character is used as a backup, and only comes into play once the first character you are controlling has met their demise. There's a few ways you could run through the temple too, because there's the boulder path, and then crossing over the traps, getting you off of the boulder path. There's always a choice to make. You can even be a wanker, and decide to risk knocking planks off the wonky bridge by jumping on it, to make it hard for those behind you to make their way out as well. After all it's a competitive game, and once inside the temple, it's every man or women for themselves. The miniatures are unpainted, as is the boulder, walls and wobbly bridge. You could however paint them up if you wanted to. They're definitely nice enough, and the plastic looks like the same type of plastic that wargame miniatures utilize. Therefore it wouldn't be terribly difficult to spice them up. There's an alternative to that even. 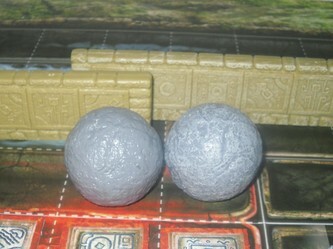 AEG also offers a set of pre-painted miniatures which are duplicates of the minis in the box, plus a pre-painted set of walls, the boulder and wobbly bridge. I have to admit, for being pre-painted, the miniatures are rather nice. Although the pre-painted walls, boulder and bridge aren't much of an improvement over the ones that come with the game itself. The accessories just look to be quickly once-overed with a single color to add a little something to them, but the miniatures in the set are definitely painted with multiple colors, and are even ink washed quite nicely to bring out the detail. 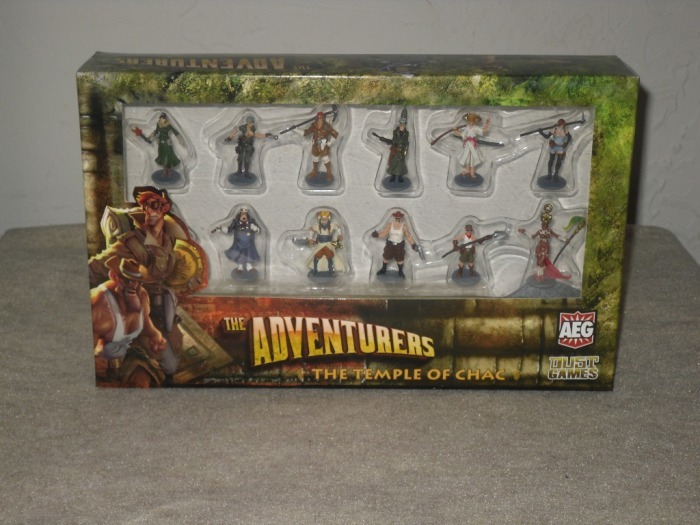 It's really a very nice set of figures, and if you find The Adventurers enjoyable, you'll definitely want this set to go along with it. 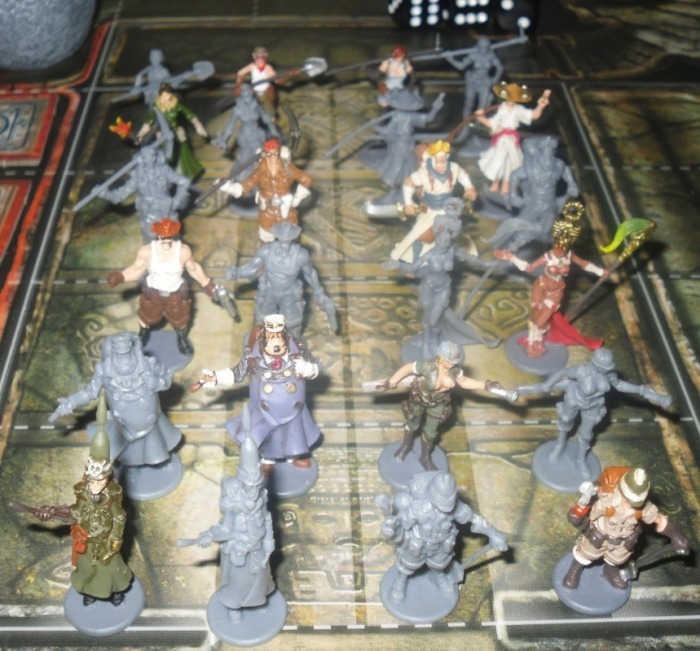 It's hard to really appreciate the unpainted figures, once you've seen the painted versions. 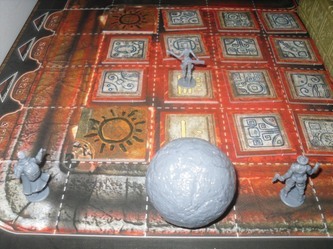 The Adventurers is unique and competitive enough to enjoy with some gaming pals, but simple and engaging enough that it could be a family game just the same. I'm really impressed with this game. I've always been a big Indiana Jones enthusiast, but not so much a Lara Croft fan tho. The entire whimsical and over the top art style is what had drawn me to the The Adventurers to begin with. Overall it's an excellent lighthearted board game for 2-6 players, and after you've played it once, it's almost impossible not to catch on and get the feel for it. This is a game that doesn't make your brain hurt trying to “Get it” The suggested age is 10+, and I'd have to agree that's about right, as I was able to play it with my twin 9 year old girls, and 13 year old son, and after the first round they all caught on and were enjoying it. My only gripe would be... I can see that it wouldn't be hard to memorize the glyphs after a while, as there are just 14 of them, and after you've played it enough times, you would definitely start to remember what some of the matching combos were. There's also the fact that while it is great fun, I think after you played it every weekend for months on end it may begin to get old, because the fact is, the board is rather small at 22-inches x 22-inches. Although there is some replay value, by using other characters, because each one of them does bring a unique ability to the table, even if it's a one shot ability. All in all, this isn't a terribly long game either, depending on how many players you have. With two players I've been done in 30 minutes flat with a single game, and other times it has taken as long as 45-minutes to one hour max with 4+ players. After you've had a few trial runs, it runs really smooth too. Again, it's more of a race against time game, with lots of very cool danger elements keeping you on your toes. The entire product is amazingly attractive in presentation too. 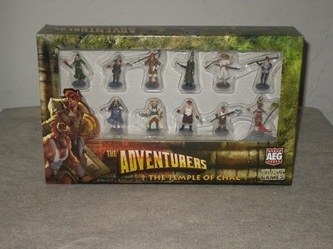 Cost-wise on average I've seen the The Adventurers selling for as low as $35, which for a game this durable, and well done, it's definitely worth that, or more. 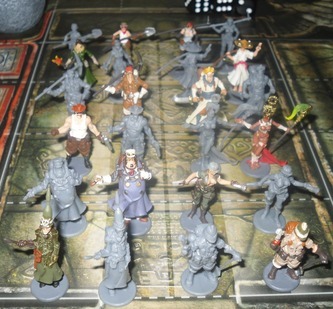 The pre-painted miniatures expansion pack carries a pricetag of about $30 tho, and that sounds like a bit much, but if you think about it, that's just $2.50 per figure, not counting the accessories. 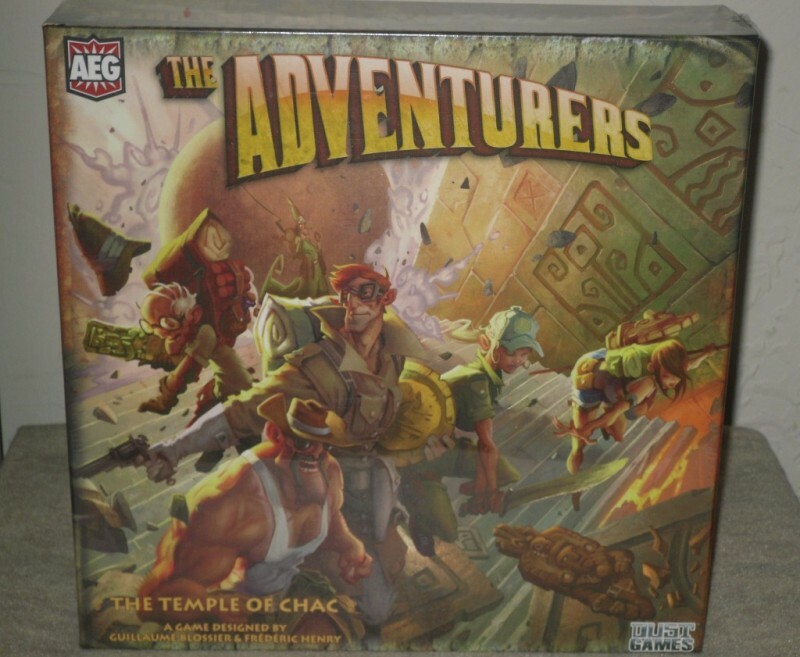 I've seen other board games of this quality selling for $60-$100, so $65, even $70 for The Adventurers+The Adventurers pre-painted figure expansion pack is quite reasonable. I should also add, that I'd go as far as saying that these figures are probably some of the very best pre-painted plastic miniatures I've ever seen, and I've seen everything out there to date, and none of them look as nice as these.